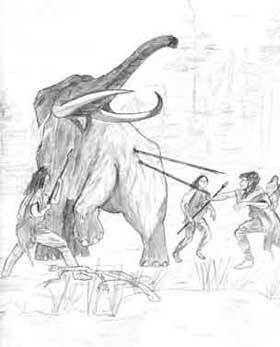 Paleo Indians hunting a wooly mammoth. As glaciers receded from this area, migrating groups of people settled throughout this regions grasslands and woodlands. They hunted mammoth, caribou, bison, fish and small game, using Clovis points and other lithics. The climate began to warm. As the climate continued to warm and the grasslands expanded, greater numbers of bison and other species became available for food. The implements used for hunting became more sophisticated and diverse. Ground stone tools were used as well as tools made of copper. The use of axes became widespread. There appears to have been seasonal settling utilizing plant resources as well. Indian burial mounds located in Bloomington. The mounds of the Minnesota River (prehistoric sites within Bloomington) begin four miles southwest from Fort Snelling and continue westward to Bloomington Ferry Road along the bluffs. Between 1,000 and 350 years ago. The Iowa people (1,000-300 years ago) and the Oneota people (300 years - early 1600s) occupied the ancient village during the Woodland Period. Hunting and gathering provided most of their food requirements, and plant domestication took place. These Mound Builders founded the first permanent settlement in the Nine Mile Creek area of Bloomington where the creek enters the Minnesota River. 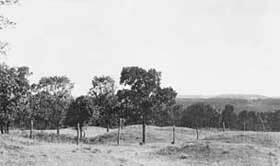 Historical information from the Office of the State Archaeologist, The Aborigines of Minnesota, Hill, Lewis, Brower, Winchell, 1906-1911, Minnesota Historical Society, Bloomington History Clock Tower Association, Bloomington Historical Society Archives.